Countdown favourites Ol’ 55 made their way into the history books during the 1970s and 1980s with chart topping singles such as On The Prowl, Looking For An Echo and (I Want A) Rockin’ Xmas. They smashed on to the music scene with their 1950’s and early ‘60s inspired sound in 1976 with the acclaimed debut long player Take It Greasy. The multi-platinum album established them as one of the biggest bands in the country while their live performances cemented their reputation as one of the most powerful bands on the burgeoning live circuit. They were more than mere revivalists; they not only blew the local audiences away, but also impressed the international headliners with whom they toured (ELO, Chuck Berry, Bo Diddley et al). They were great entertainers, and they made great records. Ol’ 55’s initial success could be attributed in part to the management of Glenn A Baker and two strong musical personalities – front-man Frankie J Holden and Wilbur Wilde on sax. 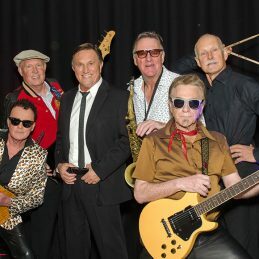 The band’s antics not only saw them on the covers of the popular music press of the time, but also as TV Week poster boys (especially the Heart-throb Jim Manzie and the Striking guitarist Patrick Drummond). They quickly became regulars on Countdown, Donny Sutherland’s Sounds Unlimited, The Paul Hogan Show, Mike Walsh and Hey Hey it’s Saturday. The band can lay strong claim to originating the ‘Half-time Rugby League Grand Final performance’ tradition when they circled the ground on the back of a tray-truck at the brutal 1976 Parramatta/Manly-Warringah Clash at the SCG. It may be hard to believe it’s been over four decades since Ol’55 became a household name, but they’ll be celebrating in true rock ‘n’ roll style when they hit the road with Frankie and Wilbur – following the release of much-anticipated special 2CD, 56-track anniversary release Time to Rock ‘n’ Roll: The Anthology. Bass Player Jim Manzie’s Power-Pop hit ‘Stay while the night is Young’ and ‘Two faces have I’ dominated by Lead singer/Guitarist Rockpile Jones were among the strong vocal songs that parlayed the band into the eighties for yet another string of Dynamic Gigs, TV Appearances and hits. Get yourself ‘Cruisin’ for a Bruisin’!